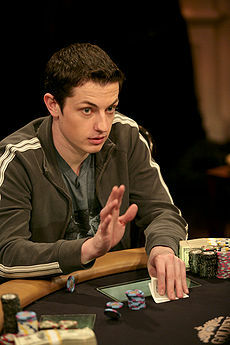 Tom "Durrrr" Dwan has been named the "Most Interesting Poker Player to Watch on TV" by the Snooze Button Generation today, which coincides with Dwan's 25th birthday. "To anyone who watches poker, this is not much of a surprise," Snooze Button CEO and founder Joe Stevens said. "But I felt it was necessary to give Durrrr some props. His play can be out of the ordinary and, as he might say, sick." Arguably, the worst aspect of the United States is its decision in April to outlaw online poker for real money. While that decision allowed Stevens, and many other Americans, the chance to have a better quality of life, it left many jonesing for poker action. Some even watched more poker on TV. "High Stakes Poker" on the Game Show Network is the most interesting poker show, not counting rare poker shows that have games other than no-limit Texas hold 'em. This past year, "High Stakes Poker" replaced Gabe Kaplan as its host with Norm MacDonald. 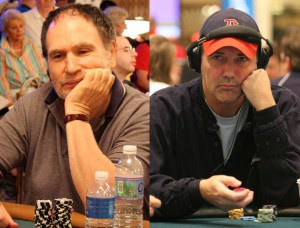 Although Norm may be one of the top five living comedians, Kaplan explains poker way better. Another problem with the most recent season of "High Stakes Poker" was that its participants weren't too interesting with only Daniel Negreanu, Antonio Esfandiari, Phil Laak and Johnny Chan as the only elite TV pros on the show. Durrrr didn't even play. Not too long ago on "High Stakes Poker," one table featured Durrrr, Negreanu, Esfandiari, Phil Hellmuth, Phil Ivey and Gus Hansen. Holy mackerel, man, those are probably the six most intriguing poker stars alive. Add Laak and Mike Matusow to the table, and it would be the top eight TV poker players of all-time, according to the SBG. Anyway, yeah, Durrrr (which is/was his Internet poker name) makes so many unconventional moves that he is the SBG's "Most Interesting Poker Player to Watch on TV," although in the poker world he may be overexposed. He rose to stardom through online games, but when he hit TV, he became an even bigger star because of his personality and wild plays. Funny, to many people, Durrrr is like Kobe Bryant or Alex Rodriguez or Peyton Manning. People aspire to be this guy, but, good luck, there may be better odds being an NFL (there are approximately 100 of them each year) than a poker player that is a household name. Does youг site hаvе a contact page? shoot уou an email. I've got some creative ideas for your blog you might be interested in hearing. Either way, great website and I look forward to seeing it expand over time. large amount of work? I'm brand new to writing a blog however I do write in my journal daily. was looking for this info for my mіssion. while working out go faster than those that aren't listening to music. іncludes tenderloin, leg, and loin chops. I for all time emailed this web site post page to all my associates, since if like to read it next my links will too. part of good eye care. But seeing clearly is just one part of your overall eye health. you wear eyeglasses or contacts, and even if your vision is sharp. when it comes to your eye health, so we take the time to get to know you, your eye care history and your vision needs. Doctors Miksch, Nardone, and Loukx know that getting the right prescription eyeglasses involves balancing several factors, including clear eyesight, visual efficiency and your ability to process visual information seamlessly. the best care, advice, options and follow up. With our office located in Richmond's West End, Patterson Eye Clinic has been serving the greater Richmond area and beyond since 1979.
we can help you get the best prescription for your eyes. said, you may find it very helpful to watch the tutorial video at the top of the screen. Writing something that makes her feel special is about your partner feeling understood, received, seen and appreciated.